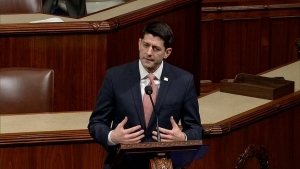 DALLAS (WBAP/KLIF News) – House Speaker Paul Ryan is in the Metroplex this week. Ryan toured Southwest Airlines Monday morning and then held a private town hall meeting with the company, who recently announced employee bonuses as a result of the tax cuts and the jobs act. He told the crowd the economy is in a good place right now. “There’s no reason not to get people out of poverty and into the economy. There’s no reason not to get people with the skills that they need so they can get good jobs and good opportunities. You’re hiring what about 8,000 people?” he said. Employees told Ryan stories about how they spent the bonuses. One employee said he spent his $1,000 bonus on his daughter’s education. “I took that check made the best paper airplane I could make and sailed it four miles east to Southern Methodist University where my daughter is an undergrad,” he said. House Ways and Means Committee Chairman Kevin Brady spoke about other benefits from the recently passed bill. “It just helps level the playing field within our country between industry sectors. We were a full taxpayer and now it makes us a lot more competitive with other industries,” he said. Ryan will meet with Catholic Charities of Fort Worth on Tuesday.